Sheet Metal blends traditional fabrication principles with contemporary tools and technology. This edition includes workbook questions and is concisely written, with large, two-color illustrations and updated photography to emphasize key points. The first six chapters provide an introduction to safety, tools, machinery, materials, and fasteners used in the sheet metal trade. The next six chapters cover cutting, forming, and joining methods. Chapters 13 through 17 cover basic drafting principles and pattern development. 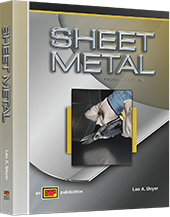 Chapter 18 covers specification, layout, and fabrication of sheet metal used in the building trades. Chapter 19 covers the short method of pattern development.